Ever since going paleo I’ve been experimenting with a lot of different nutrition-packed vegetables like Swiss chard. I’m always trying new ways to dress up a wide variety of veggies so I can make our paleo and gluten free diet fun AND palatable. 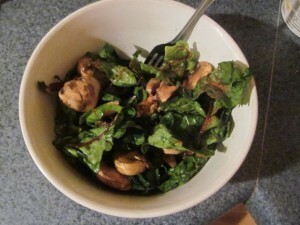 Let me tell you, Swiss chard was NOT my favorite (I find it very bitter sometimes), but I’m pleased to say that this paleo swiss chard and mushrooms dish featuring Cajun’s Choice Blackened Seasoning tastes terrific. Sure, it takes a little creativity and spices, but it is so worth it to experiment and see what you can do with healthy veggies to make them delicious. Here are some more delicious paleo gluten-free veggie side dishes that I’ve come up with. I have been using the easy-to-find Cajun’s Choice spice below on many recipes lately, like salads, chicken, coleslaw, eggs and now of course veggies. Contact me if you have any trouble locating this particular spice. It is all over the U.S. and in all major grocery stores and in many meat and seafood stores too. Ever since going paleo, I’ve been experimenting with a lot of different nutrition-packed vegetables like Swiss chard. I’m always trying new ways to dress up a wide variety of veggies so I can make our paleo and gluten-free diet fun AND palatable. Let me tell you, Swiss chard was NOT my favorite (I find it very bitter sometimes), but I’m pleased to say that this dish tastes terrific. Add the garlic and toss until a bit brown – about 2 minutes. Add the swiss chard and stir fry again until tossed with butter and mushrooms. About another 5 minutes or so.